Mostafa Dehghani, S. Gouws, O. Vinyals, J. Uszkoreit, and L. Kaiser. "Universal Transformers". In Proceedings of International Conference on Learning Representations, (ICLR'19). Mostafa Dehghani, A. Mehrjou, S. Gouws, J Kamps, B Schölkopf. "Learning from Samples of Variable Quality", In Proceedings of ICLR Workshop on Learning from Limited Labeled Data (ICLR-LLD'19). Mostafa Dehghani, H. Azarbonyad, J. Kamps, M. de Rijke. "Learning to Transform, Combine, and Reason in Open-Domain Question Answering'', In Proceedings of the Twelfth International Conference on Web Search and Data Mining (WSDM2019). H. Zamani, Mostafa Dehghani, W. B. Croft, E. Learned-Miller, and J. Kamps. "From Neural Re-Ranking to Neural Ranking: Learning a Sparse Representation for Inverted Indexing", In Proceedings of the 27th ACM International on Conference on Information and Knowledge Management, 2018 (CIKM ’18). H. Azarbonyad, Mostafa Dehghani, T. Kenter, M. Marx, J. Kamps, and M. De Rijke, "HiTR: Hierarchical Topic Model Re-estimation for Measuring Topical Diversity of Documents" in IEEE Transactions on Knowledge and Data Engineering (TKDE). H. Zamani, Mostafa Dehghani, F. Diaz, H. Li, and N. Craswell, "SIGIR Workshop on Learning from Limited or Noisy Data for Information Retrieval (LND4IR)". In Proceedings of the 41st International ACM SIGIR Conference on Research and Development in Information Retrieval, 2018 (SIGIR ’18). Mostafa Dehghani, A. Mehrjou, S. Gouws, J Kamps, B Schölkopf. "Fidelity-Weighted Learning", In Proceedings of International Conference on Learning Representations, (ICLR'18). Mostafa Dehghani, and J. Kamps. "Learning to Rank from Samples of Variable Quality", SIGIR Workshop on Learning from Limited or Noisy Data for Information Retrieval (LND4IR'18). T. Kenter, A. Borisov, C. Van Gysel, Mostafa Dehghani, M. de Rijke, and B. Mitra. "Neural Networks for Information Retrieval'', Tutorial at International ACM International Conference on Web Search and Data Mining (WSDM'18). T. Kenter, A. Borisov, C. Van Gysel, Mostafa Dehghani, M. de Rijke, and B. Mitra. "Neural Networks for Information Retrieval'', Tutorial at European Conference on Information Retrieval (ECIR'18). Mostafa Dehghani, A. Severyn, S. Rothe, and J. Kamps. "Learning to Learn from Weak Supervision by Full Supervision", the NIPS2017 workshop on Meta-Learning (MetaLearn 2017). Mostafa Dehghani. "Toward Document Understanding for Information Retrieval", article published on SIGIR Forum December 2017, Volume 51 Number 3, 2017. Mostafa Dehghani, A. Severyn, S. Rothe, and J. Kamps. "Avoiding Your Teacher’s Mistake: Training Neural Networks with Controlled Weak Supervision", arXiv preprint arXiv:1711.00313 (2017). Mostafa Dehghani, S. Rothe, E. Alfonseca and P. Fleury. "Learning to Attend, Copy, and Generate for Session-Based Query Suggestion'', In Proceedings of International Conference on Information and Knowledge Management (CIKM'17). H.Azarbonyad, Mostafa Dehghani, J. Kamps, and M. Marx. "Words are Malleable: Computing Semantic Shifts in Political and Media Discourse", In Proceedings of International Conference on Information and Knowledge Management (CIKM'17). N. Torkzadeh Mahani, Mostafa Dehghani, M. S. Mirian, A. Shakery, and K. Taheri, "Expert Finding by the Dempster-Shafer Theory for Evidence Combination", Journal of Expert Systems. Mostafa Dehghani, H. Azarbonyad, J. Kamps, M. de Rijke. "Share your Model instead of your Data: Privacy-Preserving Mimic Learning for Ranking'', In Neu-IR: SIGIR Workshop on Neural Information Retrieval [Poster]. R. Rahimi, A. Shakery, J. Dadashkarimi, M. Ariannezhad, Mostafa Dehghani, and H. N. Esfahani. "Building a Multi-Domain Comparable Corpus Using a Learning to Rank Method". Journal of Natural Language Engineering, Cambridge University Press, Volume 22, Special Issue 04, 2016, pp. 627-653. Mostafa Dehghani, A. Shakery, M. S. Mirian. "ALECSA: Attentive Learning for Email Categorization using Structural Aspects". Knowledge-Based Systems Journal, Volume 98, 2016, pp. 44-54. S. H. Hashemi, Mostafa Dehghani, J. Kamps, "Parsimonious User and Group Profiling in Venue Recommendation", In Proceedings of Text REtrieval Conference (TREC), 2015. 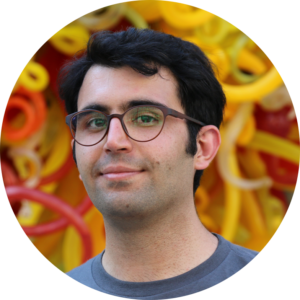 S. H. Hashemi, Mostafa Dehghani, J. Kamps, "University of Amsterdam at TREC 2015: Contextual Suggestion Track", In The Twenty-Fourth Text REtrieval Conference Notebook (TREC). National Institute for Standards and Technology, 2015. Mostafa Dehghani, H. Azarbonyad, M. Marx, and J. Kamps. "Learning to Combine Sources of Evidence for Indexing Political Texts", In proceedings of Dutch-Belgian Information Retrieval (DIR'15), 2015, pp. 24-24. H. Azarbonyad, Mostafa Dehghani, M. Marx, and J. Kamps. "Time-Aware Authorship Attribution of Short Texts", In Dutch-Belgian Information Retrieval (DIR'15), 2015, pp. 9-9. S. Abnar, Mostafa Dehghani, H. Zamani, and A. Shakery, "Expanded N-Grams for Semantic Text Alignment", Notebook for PAN at Conference and Labs of the Evaluation Forum (PAN'14), 2014, pp. 928-938. 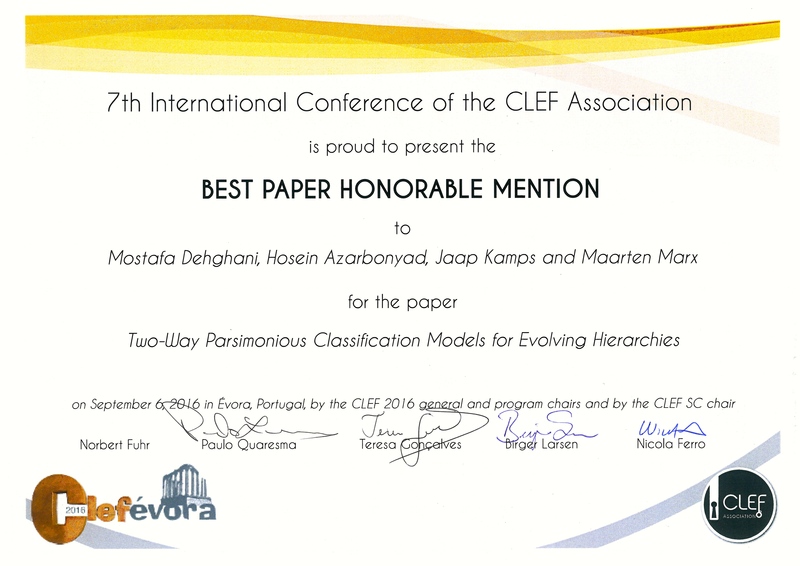 H. Zamani, H. N. Esfahani, P. Babaie, S. Abnar, Mostafa Dehghani, A. Shakery, "Authorship Identification Using Dynamic Selection of Features from Probabilistic Feature Set", In Proceedings of Conference and Labs of the Evaluation Forum (CLEF'14), 2014, pp. 128-140. A. Balali, H. Faili, M. Asadpour, and Mostafa Dehghani, "A Supervised Approach for Reconstructing Thread Structure in Comments on Blogs and Online News Agencies", Computación y Sistemas Journal, Volume 17 Number 2, 2013, pp. 207-217. H. Hassanpour, Mostafa Dehghani, and Y. Keneshloo, "Personalizing Search Engine Results Based on User Behavior", In proceedings of The Iran Data Mining Conference (IDMC'04), 2010 (In Farsi).